Lee is a music producer and both Beth and Lee absolutely adore disco, so the wedding theme was Studio 54, with a vinyl DJ, sequins and disco balls galore. And glitter. Lots, and lots of glitter. Our pre-wedding session was loosely based on actual events on the night when Beth and Lee decided to get married. It was a 'Walk of Shame' shoot - Beth and Lee walking home in the small hours of the morning following an epic party with a bottle of champagne in hand and a pair of shoes in the other. Inappropriately dressed as the world wakes up to go to work. We started in Tynemouth Metro station and then walked up Front Street towards the Priory, ending up above the beach at King Edwards Bay. The weather was atrocious, wet and cold, so it suited a moody edit in the final images. Beth and Lee are a creative couple so I knew I could experiment with a darker, more edgy feel. The engagement shoot was almost called off at the 11th hour when Beth broke her elbow. Bravely she elected to press on despite spending most of the previous day in hospital. 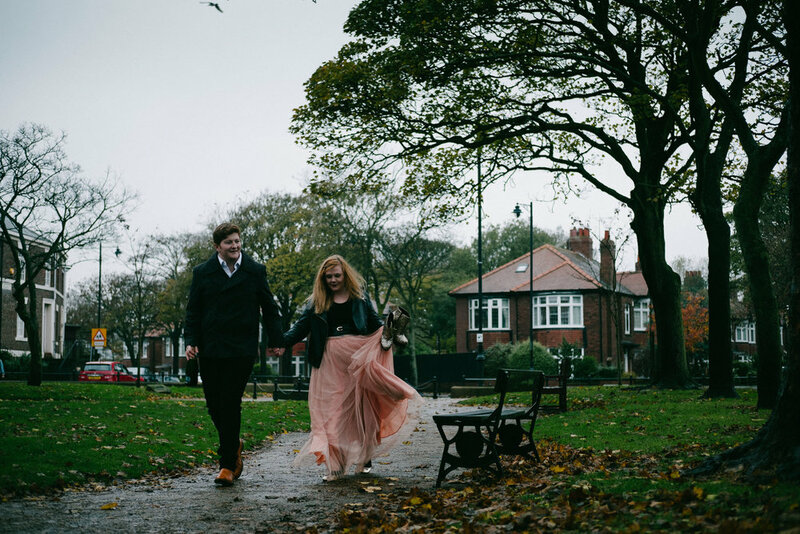 To see more couples sessions, and real weddings, have a peek at my Newcastle weddings page.